Bonsai tree diseases can be very dangerous, and even fatal, to your plants. By recognizing the signs and treating the problem quickly, you will increase the chance of recovery and help prevent the spread of infection. Some trees are more susceptible than others to particular diseases or fungi, so it is important that you research your species and understand which illness are most common for your type of plant. Improper care can cause your tree to become sick or stressed and make it more susceptible to illness and disease. A strong, healthy plant is much less likely to contract viruses or develop fungi and moulds, so the best prevention is to give your tree everything it needs to stay in good health and protect itself from bacteria and disease. Once you discover the presence of disease, the first priority is to make sure that you prevent it from spreading to the rest of the tree or to other plants in your collection. 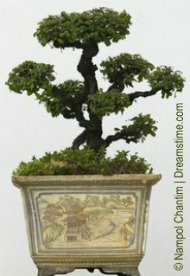 It is important to examine your bonsai regularly for signs of illness or infection. This will allow you to catch any problems early, and take all the steps necessary for a quick recovery. If left unattended, some bonsai diseases can cause severe damage, or even death. 1. Immediately remove your tree to a secluded location away from other plants to prevent cross-contamination or the spread of disease and infection. 2. Remove all affected leaves or infected growth. 3. Spray healthy foliage with a recommended fungicide. 4. Check for possible causes of disease such as root rot, poor ventilation, or over-moist soil. 5. Sterilize all tools used in pruning the affected tree. 6. Place the treated tree in a well ventilated area with proper lighting to prevent reinfection. Leaf Spot: Similar to Black Spot, this fungus is characterized by white, black, brown, or grey spots (depending on the species), on leaves or small twigs and branches. Typically, blemishes will be white at first and then change to a darker color as the disease progresses. Eventually, lesions will develop, and foliage will wither and die. Any affected leaves, fruit, or branches must be removed immediately, the soil cleaned of any debris, and healthy foliage sprayed with a fungicide. Mould or Mildew: Mildew is a fungi that thrives in damp environments with insufficient sunlight and poor ventilation. A White (Powdery Mildew) or Black (Sooty mould) substance appears on the foliage, stems, or branches and can cause distorted growth, discoloration, and loss of vigor or dieback. It is impossible to completely eliminate the mildew from infected leaves, therefore the affected foliage and shoots must be removed as soon as possible. Spray the tree with a fungicide to prevent reinfection. Sometimes, Black Sooty Mould can be caused by an infestation of aphids or scale insects. Removing the pests by hand and/or spraying your bonsai with a mild insecticide will help eliminate the insects, but infected foliage will still need to be removed and a fungicide applied. Make sure to place your tree in an area with sufficient sunlight and ventilation. Rust: This is a fungal disease that appears as yellow, orange, red, or brown raised bumps or blisters on the undersides of leaves. Eventually, the leaves will curl up and fall off. Although Rust infections are not usually fatal, they can cause severe damage to your tree. It is important to remove the affected area and treat the healthy foliage with a fungicide. Remember to place the plant in a well ventilated area to prevent reinfection. Chlorosis: This is a condition caused by a lack of chlorophyll and results from a damaged or compacted root system as well as nutrient deficiencies such as a lack of iron. Leaves will turn yellow but the veins will remain green and the plant will begin to wilt. Adding chelated iron to the water and taking proper care of your tree's roots will help treat chlorosis. Root Rot: Improper drainage can cause roots to turn brown and mushy. Leaves will also become discolored, branches may weaken and break off, and growth will be stunted. Affected roots must be pruned away and the bonsai transplanted into fresh soil. Make sure that your choice of container and medium allows for sufficient drainage so that roots are not overwatered. Scab or Canker Diseases: These diseases can appear as a fading of leaf color, poor growth, or a swelling of the bark. Many canker infections develop after pruning, and treatment requires cutting out the infected areas and then applying wound paste. Other scab and canker infections may be caused by too much nitrogen or improper fertilizing. By following recommended fertilizing and pruning procedures you can prevent the occurrence of these diseases. While prevention is the best way to stop the spread of disease and infection, there are times when even the healthiest plants fall victim. Recognizing the signs and beginning treatment immediately will help give your plant the best possible chance of recovering while also protecting the other trees in your collection.